Life of Moi | My life. What I do. Who I meet. Where I visit. This isn't about me though, is it? My life. What I do. Who I meet. Where I visit. This isn't about me though, is it? Feminism – is this the right direction? This probably will be my least popular blog post. I am going against the wave – something I often can’t help but do. The wave? Feminism. The flood of “respect women” status updates on Facebook. The tonnage of judgmental videos about men not respecting women enough going viral. Let me tell you frankly – it is worrying. The source of the worry is one basic question – do women want to be treated equally or do they want to be treated special? Or, do they want a third, most lucrative option – to be treated as equal and to be treated special, depending on the situation? Doesn’t the plethora of campaigns in place to promote the idea of respect women – asking for respect for women as if they’re special – go contrary to the concept of equality? Why not promote instead – “respect people”. And if women feel they’re not being given as much respect as they deserve, may be a campaign for “women are people too!” I’m sure persons more creative than me can come up with better phrases, but you get the general idea. Why should I respect women? Seriously, why should I respect a person just by virtue of something he or she is born as. Isn’t this somewhat similar to the notion “Brahmins are holy”? Isn’t this somewhat similar to “Muslims are terrorists”? Why should I respect a person because she was born a woman? 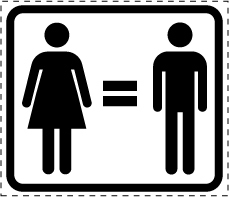 Instead, why not treat everyone equally – respect a women if she deserves respect. Of course, goes without saying, don’t disrespect her if she doesn’t deserve to be respected. And this should be same for everyone – men, women, children – everyone. Respect people. Disrespect no-one. Shouldn’t this be promoted instead of “respect women”? Domestic abuse in public – How people react will shock you! Why did the people react this way? It has been ingrained in their minds that it is socially acceptable, encouraged and necessary to ensure that women are respected. Which is absolutely fine – nothing wrong with that. But when it comes to helping preserve the respect of a man, they’re clueless. They don’t know what the socially acceptable norm is. They just don’t know how to react, what is right and what is wrong. They were never told to respect everyone equally, they were flooded with lessons about respecting women. This is where India is heading if the lessons we are teaching the masses don’t change. This entry was posted in Uncategorized and tagged education, facebook, feminism, gender equality, India, social media, society, women on September 26, 2014 by suyashmisra. Education in the 21st Century – Why are we still memorizing? Imagine a financial analyst’s office. What’s the first thing you imagined? Probably a desk with a laptop. Imagine an architect’s office. A lawyer’s office. A marketing consultant’s office. Still imagining laptops? I won’t make you imagine their pants, but if you did, you’d imagine smartphones in their pockets. Computers and smartphones, which provide us whatever information we need in a matter of moments. Welcome to Information Age 2.0. And yet, it seems the education sector hasn’t caught up. Students preparing for exams still spend a considerable amount of their time memorizing stuff – often stuff they downloaded off the Internet! You have 24 hour access to the Internet, you can get any information you need as long as you know some reliable sources, so you go on the Internet, download some material relevant to your subject, forcefully inject it into your short term memory, and write it the next day, or a few days later, on an answer sheet in an exam, and forget most of it in less than a week. No problem though, you have 24 hour access to the Internet, so you can get that information again, in like a couple of minutes, if you need it. Am I the only one here that thinks something is not right? Why are the basics behind the education system still the same today as they were when my parents were students? They don’t call it the Information Age just because information is readily, almost effortlessly, available. There’s another aspect – there is an abundance of information available, and most of it is changing every minute. So not only is memorizing useless because of the availability of information, it is also useless because of the minuscule, almost negligible, percentage of information one can possibly memorize. From what can be memorized, a small percentage can be retained. From what little that can be retained, a majority will become obsolete in a short while. Why does the education system often makes students memorize statistics from 2011 when the same statistics from this morning can be accessed on a Nokia Asha? Memorize (v) – commit to memory. This commitment doesn’t need to be forced anymore. We all have access to the sources of information, but there should, of course, not be a dependency on them at all times. So whatever information is needed on a regular basis, and is constant, will be registered in the memory automatically sooner or later. Forced commitments seldom last. A Saint was once asked by a disciple – “They say you know everything. Do you really?” He smiled and replied, “no, but I am always connected to the source.” In this information age, we are all connected to the source (of academic subjects, at least, if not the spiritual) and yet, instead of dedicating themselves to understanding more, students are made to fritter away their time in memorizing more. It’s time for some long due change, isn’t it? This entry was posted in Uncategorized and tagged change, education, information, learning, memory, students on May 20, 2014 by suyashmisra. It just hit me. People who posted on Facebook things like “thank you for everything, 2013” are not as weird as I thought. May be they are just more connected with themselves than I am. Because I realized a minute back, one day too late, how amazing 2013 was. Met all new friends in 2012, and spent the entire year, 2013, with them – amazing time. Being all stressed out during exams and having crazy fun rest of the times. Often students are unhappy with the institute they study in, because they focus on the current scenario – teachers not up to the mark, placements not ideal, class schedules and projects to deal with, and innumerable other issues – and forget what a blessing it is to be in the institute in the first place. For me, it is an honor to be a student of Motilal Nehru National Institute of Technology, for which I am grateful every day. While joining the institute, traditional things like faculty, placements, etc. were far below in my list of priorities. What I wanted was a good and fun environment, a great cafeteria, extra-curricular activities and a green campus with lots of roads to stroll on. I remember how my friends rolled their eyes when I enquired about the college they were recommending to me, “does it have good lawns and many roads?” My college has all the things I had wanted. Academically, this year I performed in a manner that astonished me – 2nd in the batch, and towards the end of the year came just 2 marks apart from the top position. In my past I have always regretted not being active in terms of extracurricular activities. All that changed in 2013. I was chosen as a core coordinator of a national level fest in MNNIT, Avishkar 2013, and despite all challenges our team (students of my batch) performed brilliantly and elevated the standard of how the management part of the event should be organised in the future. The year ended with an excellent visit to Revered Master. This visit was not just spiritually important, it also reignited my dreams of attaining financial freedom and traveling. In all, 2013 was a spectacular year, for which I feel immense gratitude. 2014 will be better! I wish you a very happy 2014 – may all your dreams come true, and may you never stop having bigger dreams. This entry was posted in Uncategorized and tagged 2013, 2014, dreams, friends, fun, gratitude, MNNIT, Motilal Nehru National Institute of Technology, new year, nostalgia, studies on January 2, 2014 by suyashmisra. Yet again, I find myself with no topic in mind to write about, but I feel this addiction building that I have to write something and share it online. This is pretty dangerous if my goal is to build this into a popular blog, because if I write just because I can’t not write, quality of my posts will suffer. Thankfully, I don’t have many aspirations for my blog, hence I can afford to write just for the heck of it. I want to write today about some recent experiences with a concept that has several names – mind over matter, thoughts become things, the law of attraction – to name a few. While I have had many experiences like this, the ones I will write about today happened in quick succession – within 48 hours. 48 hours during the end of my Chennai visit that I wrote about in an earlier post, so it’s possible that my spiritual energy was pretty high at that time (I say this with full awareness that I may be considered high for saying this). So, let’s start. I was in Chennai, Tamil Nadu, India, in a spiritual Ashram. I had spent nearly a week there and was set to leave for home in a couple of days. There was a person there who I had promised I’d meet when I reached Chennai, but I had completely forgotten about it. That day, I bumped into him, and he was not happy about me not meeting him. I too was flabbergasted upon realizing that I had forgotten to meet him, and blurted out, “I totally meant to meet you, but my flight was delayed!”. It was a lie, but once it just came out of my mouth (so you see, it was its fault really), I had to stick with it. I said at least a couple of times more throughout the entire conversation, “my flight was delayed”. The embarrassing encounter was finally over, and a while later I forgot all about it. The day came when I was supposed to leave. Just as I was finishing up packing, my airline informed me through a SMS that my flight was delayed. To such an extent that I’d miss my connecting train. Now that’s some delay! I had to change the entire reservation, and instead of leaving at 4pm that day, I left Chennai at 8am the next day – the flight I had changed the reservation to, was delayed. Instead of a train, this time I had booked another flight for the final leg of the journey. You guessed it, it too was delayed. So after I repeated thrice, “my flight was delayed”, I encountered three delayed flights. Or, in other words, I encountered no on-time flights! So there’s the delayed flight story. Be very careful about what you say, even when those darn evil words just come flying out of your mouth, with no fault of your own. Next, we come to the tube-like-airplane-transport-thing story. I don’t know what it’s called – the gallery type thing that they attach to the airplane when you land, so you can walk to the arrival area. Wait, let me google it. Okay, it’s called a jet bridge. It’s also called a portal, but it is too cool a name for something so earthly. Anyway, on with the story. I had many times landed and used a jet bridge to move from the aircraft to the terminal. But never had I entered an aircraft through a jet bridge. So one day before I was to take off from Chennai, I was wondering if airlines also transfer passengers to the aircraft through a (okay) portal. Next morning, after scores of air travels, for the first time in my life, I entered an aircraft through a jet bridge. What an experience! Not the bridge, the manifestation of my thought. I thought about it the previous day for a couple of minutes, then forgot all about it, and there it was. Thoughts become things. The next story is more interesting, I promise. Another “first time in my life” experience, just hours after I was thinking and talking about it. As I told you earlier, all my flights were getting delayed. That meant a lot of waiting time at airports. I and my parents were pretty bored, so we were talking about random stuff. Suddenly, I complained to my mom, “why don’t we ever see a celebrity in an airport?” I had, of course, seen celebrity sightings photographs, and many of them were at airports. Mom said, “that’s because they’re brought in and out of airports through special entrances and exits. It’d become so chaotic here if Shah Rukh Khan just appears all of a sudden.” I agreed with her, and said, “Mom, I’ll be perfectly fine with a small non-chaos-inducing TV actor.” At this point mom got bored of the topic and went back to her newspaper. All this happened at Chennai airport. We were at New Delhi airport, about 4 hours after the above conversation had taken place. Our flight to Allahabad was delayed by an hour, and we were just strolling around. Suddenly a familiar face caught my eye. He was an elderly looking man, with large beard, and was talking animatedly to the gentleman sitting beside him. I recognized him instantly – he was the actor who played something in that TV serial! By that time mom had seen him too. She, being the TV buff she denies being, knew all about him. His name is Anupam Shyam, and he played Thakur Sajjan Singh in a TV soap that is no longer in telecast called Pratigya. This was the first time that I ever bumped into a celebrity, major or minor. What I learned from this is that, first, think only of those things that you want, that are positive, that make you joyful. Because whatever you think might very well happen. Second, don’t worry about it. I was not making myself crazy looking for celebrities. I had forgotten all about it and was focusing on other things. But then, I was traveling – I had to take care of my luggage, make sure I was near the right gate, there were new people, new experiences – my mind was occupied. Letting go is more difficult when it comes to regular life in a routine. But as they say, practice makes a man perfect. 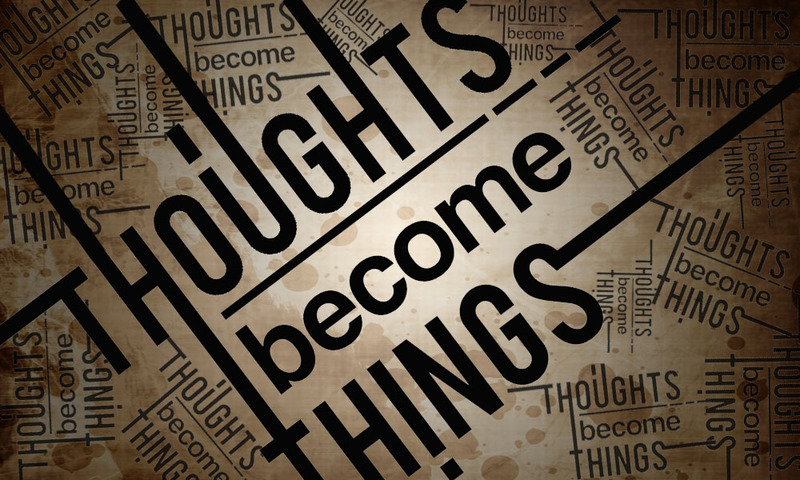 If you are reading this, please share your own “thoughts become things” experiences. This entry was posted in Uncategorized and tagged celebrity, Christmas, Law of Attraction, love, manifest, mind, news, Spirituality, thought, thoughts become things, Travel on December 29, 2013 by suyashmisra. Nothing much to write today, except this photo of a human monkey who was kind enough to pose for me from among a group of people taking photographs, at Shilp Mela, 2013, at Allahabad. 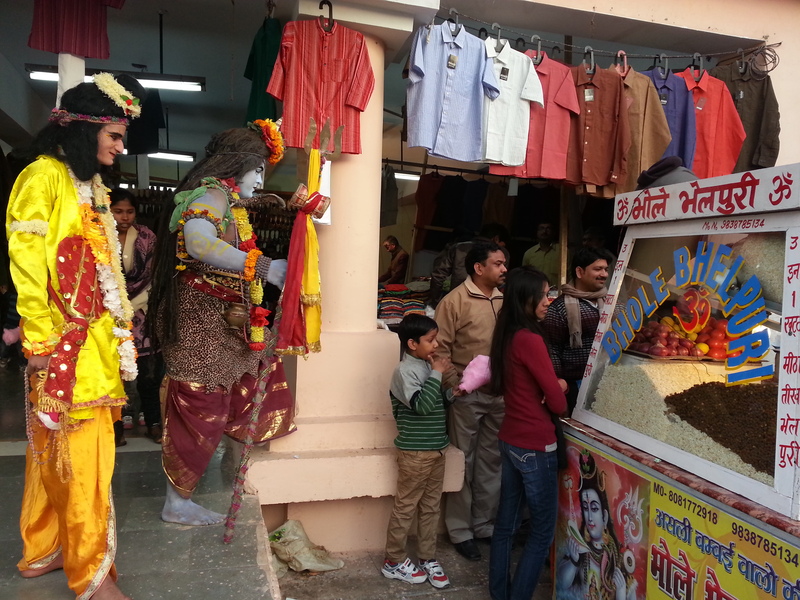 Shilp Mela is an annual gathering of vendors of traditional goods from all parts of India. Makkhan Malai from Rajasthan, Litti Chokha from Bihar, chocolates from Delhi (! ), carpets from Kashmir, and a lot of other stuff. I focused mainly on the eatables, and the monkey, while the girls in the group excitedly haggled and purchased a lot of stuff at reduced, still overpriced, amounts – such as earrings, bracelets, and other girly stuff. We couldn’t find Moong ka Halwa there though, a regular at Shilp Mela every year – will need to go once more to try and find that yummy delicacy. Here’s another photograph of a couple of Gods (yeah!) waiting for their bhel-puri to get prepared. Imagine the rage of the Almighty when the vendor chose to serve my friend before them. 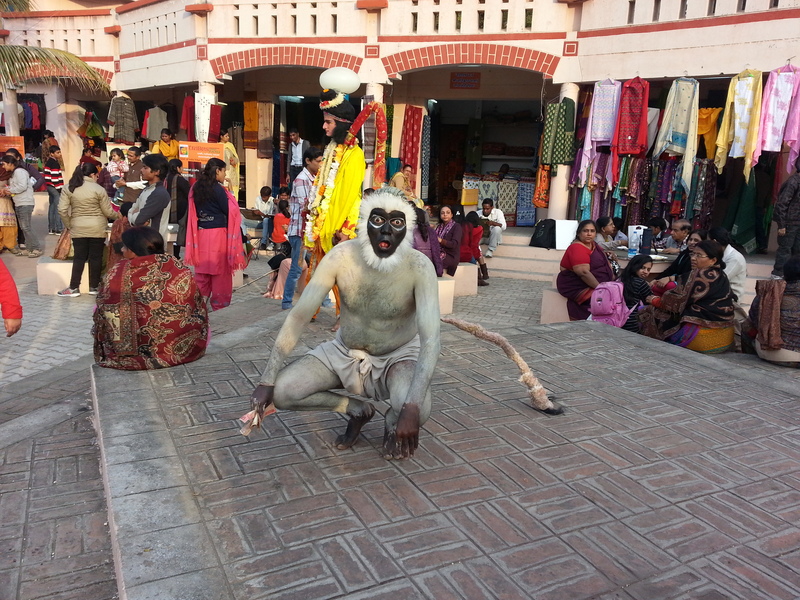 This entry was posted in Uncategorized and tagged Allahabad, friends, fun, God, India, monkey, performer, Shilp Mela, Travel on December 28, 2013 by suyashmisra. I recently got back from a visit to Chennai (capital city of Tamil Nadu, India) and feel the urge to write about it here. It was a trip with mixed emotions – happiness, sadness, exhilaration, disappointment, excitement – all were a part of it. Let me elaborate. I and my parents started out from Allahabad in the afternoon of 10th December, 2013, by Spice Jet flight 2637 to Delhi, from which we took flight 309 to Chennai. This was very new for us, as this was the first trip where we reached Chennai the very same day we left Allahabad. I know it sounds weird, but Allahabad is a small town (it is growing, but nowhere close to biggies like New Delhi or Chennai) and regular reliable flights to New Delhi have recently started (thank you Spice Jet).Till now we either took a train from Allahabad to Chennai whenever we wanted to visit Master, or we reached New Delhi by train and took a flight from there for Chennai. So this time around, despite a long wait at Indira Gandhi Airport, New Delhi, we reached Chennai in speed and comfort that I had never experienced before in a journey of this distance. If you don’t get what I am talking about, go experience an Indian railway station. One thing that I should mention here is that I’m extremely child-like when it comes to air travel. I am sure in all my air travels, my co-passengers think it’s my first time in an airplane. I am super excited about anything and everything to do with airplanes. As an illustration, let me tell you that I once spent an entire 3 hour flight not even glancing at the in-flight entertainment but continuously focusing on the real time flight information. Who cares about Bheja Fry when you can check out the plane’s speed, altitude, outside temperature, and the goddamn city we’re flying over! Similarly, at airports, I’d much rather look at the runway and the airplanes on it than TVs or shops, or even people! 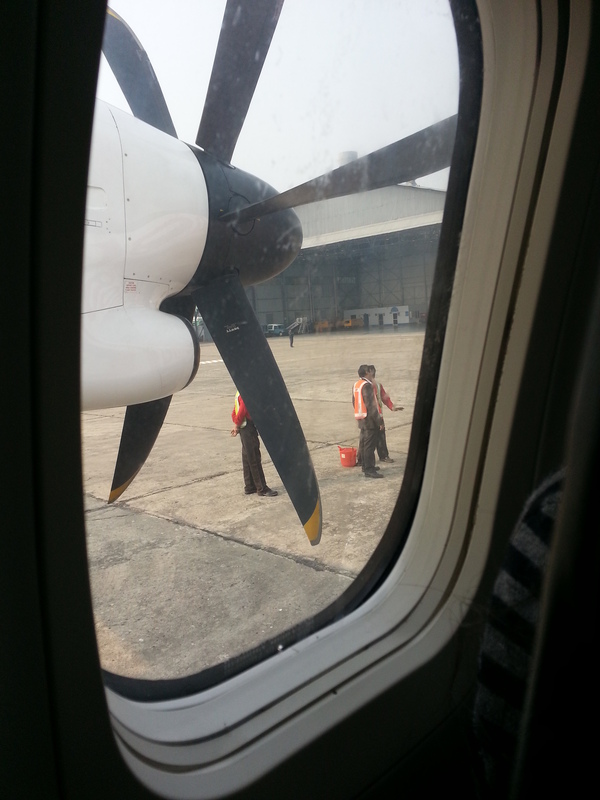 So, of course, as soon as we boarded the aircraft at Bamrauli Airport, Allahabad, I took a photograph of the propellers of our little plane. 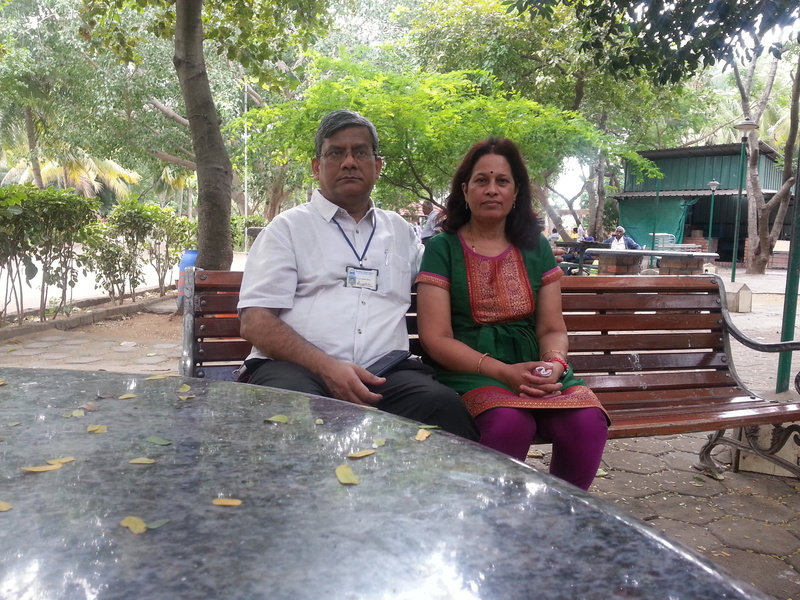 We landed in Chennai at 10.30pm and were at Babuji Memorial Ashram nearly an hour later. Thanks to correspondence undertaken well in advance, a room was available for us for our week long stay. It was a simple room with 3 beds and 3 mattresses, a light and a fan, 2 plug points, and nothing else. It had a balcony overlooking the neighboring Larsen and Toubro building, specifically their outdoor recreation facility – a basketball court and a cricket ground. Every evening we’d hear the players’ shouts of derision and screams of jubilation. 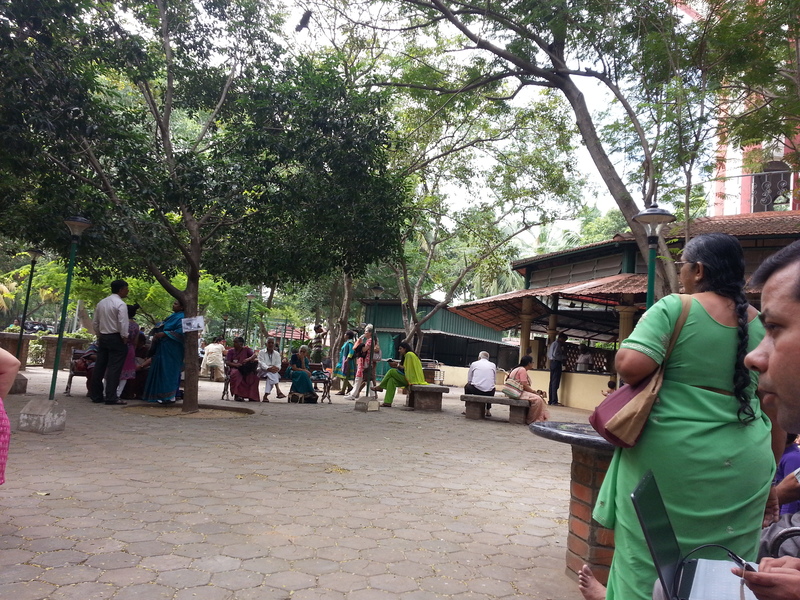 Life at the Ashram is a contrast from our normal everyday life. The most obvious aspect of stay there, which hit us our first morning in the Ashram, is that there’s nothing that we’re supposed to be doing. There is no pressing schedule, no classes, no meetings, not even places to visit like in usual holidays – once you are in, you don’t feel like leaving, such is the atmosphere in the Ashram. So the place to hang out at is the canteen. It’s a great place at the center of the Ashram, from where you can see the Meditation hall, the Master’s cottage and the dining hall. So you can relax and enjoy the delicacies available (which you have to purchase, unlike the 3 meals served at the dining hall everyday) while being updated about the three fundamental aspects of life at the Ashram – meditation, Master and, well, food. 9.30pm – “Go to sleep” bell. If you are roaming around in the Ashram after the 9.30 bell, somebody might ask you to go to sleep! This happened to me only once even though I could not resist spending time out after hours almost everyday (ignore the almost). Let me elaborate the visit in terms of the three aspects mentioned before, in no order of significance. Two places to eat – the dining hall and the canteen. I can’t say where I ate more, but I didn’t miss anything at either. Something had happened to my appetite, I became insatiable. The breakfast at the dining hall comprised of some South Indian food item, such as idli-sambhar, or rice-sambhar. Lunch often consisted of rice-sambhar, with mattha (buttermilk). Dinner was most often roti (chapati) with sambhar and vegetable. Nothing special about the food this time around. Though I must say, most of the times the food in our Ashrams is spectacular. The canteen is a different story altogether. Every item was breathtaking! Everything was prepared with so much love (and so much high quality desi ghee), I wonder if my rise in appetite was due to the assortment in the canteen! From milk, tea and coffee to chilled soft-drinks, from dosa and uttapam to samosa, khasta-kachauri and gujhiya, from boondi-laddu to kaaju katli, everything was, as that old TV commercial says, finger-licking good! In the canteen you would sit not just to eat, you would just sit there. You would look at people from innumerable countries from all around the world, who are brought there by the love they have for and the love they receive from the Master. You would observe parents of little children and realize what a full-time job parenthood is. You might find yourself in earshot of elderly abhyasis discussing the system, and you might realize how well-read some people are. You would then feel hungry, curse your suddenly elevated appetite, realize you’re out of coupons, buy some, and spend them all on some new thing you want to try. Of course, in all the above lines, when I say “you”, I mean “I”. There are other things to try too. 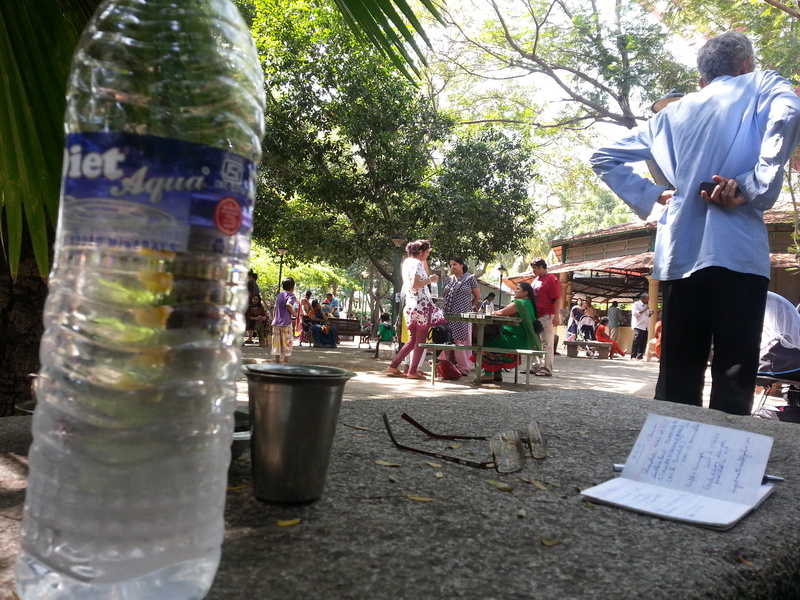 Such as naariyal paani (coconut water) which is available right outside the Ashram. But after so many trips to South India, stuff like that is mostly in my “been there, done that” list. Three times a day, the Ashram bell would be sounded to indicate that meditation will commence in 15 minutes at the Meditation Hall. It is a simple process, which is presided over by a permitted abhyasi, a Preceptor. 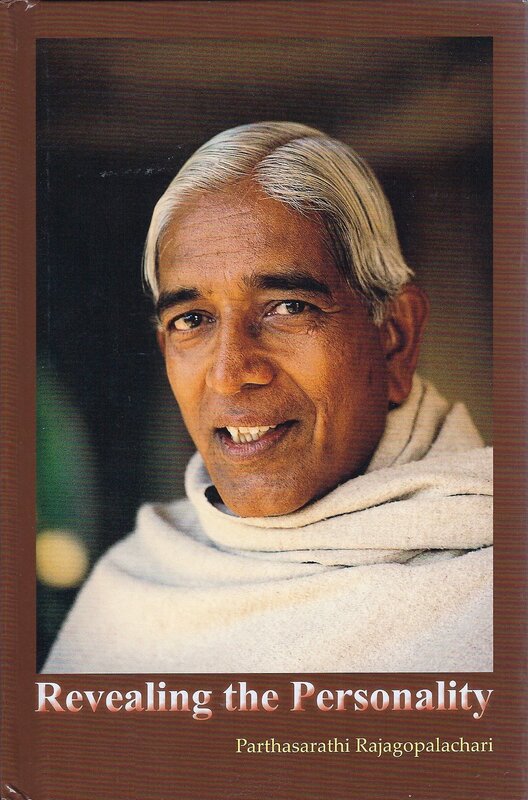 What an abhyasi (practitioner, like me) is supposed to do here is to close the eyes and focus briefly on this thought – “by the grace of Master, divine light from his heart is entering my heart, and is completely filling it”. There is no need to continuously dwell on this thought, focusing on it briefly at the beginning is enough. In case a lot of distracting thoughts come to mind, an effort can be made to calm the mind and reinstate the thought. Meditation sessions last anywhere between 45 minutes and 1 hour. Experiences may vary – from a deep meditation, or a blissful session, to restlessness, or something else. It is said that while these meditation sessions are important, it is the atmosphere in the Ashram that actually works on your soul. What does this mean? While it is highly recommended that you attend all the meditation sessions, or Satsanghs, it might not do much good if you simply go to the Ashram at the time of meditation, and do not spend time in the Ashram at other times. This is my understanding, which is very limited, hence I may be wrong. 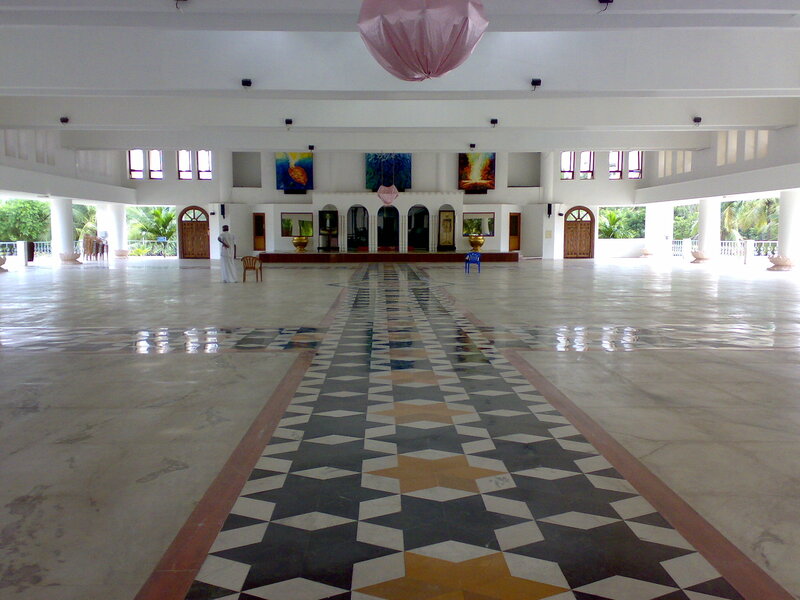 Here is an image of the Meditation hall when Satsangh was not going on. This is the Meditation hall from outside. It is not the front though – that view is epic, with the stairs leading to it and the golden lions at the entrance. I had no idea that I would start blogging, hence did not take many pictures. Sad. There are many theories among abhyasis about whether one should try to meet the Master or not. Some say a visit isn’t complete without a mulaqaat, while others say that He knows you have come, don’t impose your presence on him, don’t use him to fulfill your need to feel important, and respect his age and the limitations of the human body, specially at his age of 86. I choose which “school of thought” to listen to depending on what my heart tells me to do at any particular moment. Master too may send confusing signals, not unlike in a romantic relationship. After all, the Guru is an eternal lover. He may appear ill and frail, but at the same time ignite a deep restlessness in your heart to see him. In your confusion (or clarity), you take action. He often sits in the porch of the Master’s cottage (generally once a day). One evening when he was sitting there, my parents sent their name on a piece of paper and he called them in. I followed. He conversed informally with people seated there at the time and spoke to my parents too for some time. He asked my father about his hospital (he is a surgeon and owns a hospital) and his mother (my grandmother). It is amazing how with hundreds of thousands of abhyasis in the Mission, hundreds meeting him every week, he still has the love to remember these details about us. This meeting lasted about 30 minutes and we were very happy and content. And we were grateful. Next day, a familiar feeling started forming inside me – “I want to meet Master again.” This time, parents were not ready to cooperate. From being followers of the first school of thought, they had now, understandably, switched to the latter. Why disturb Master again if we have already met him once? But the heart wants what the heart wants. 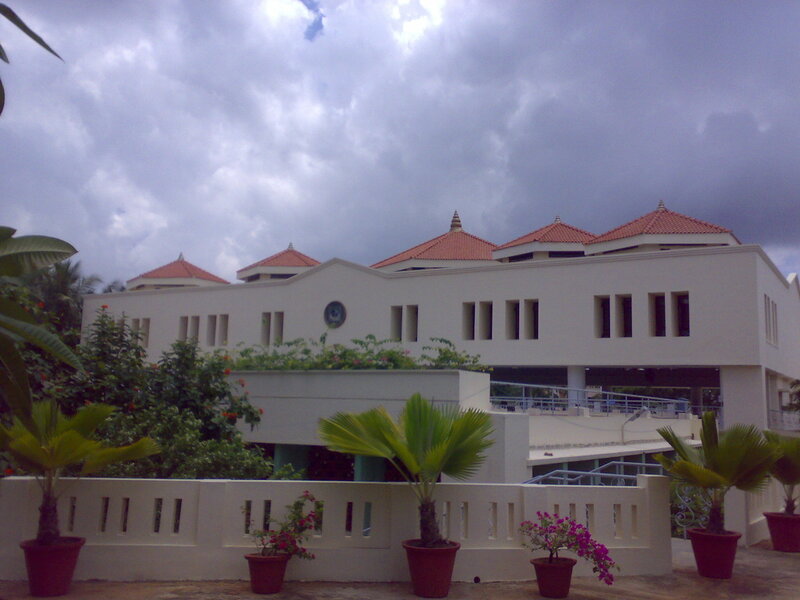 Just like my experience at Tiruppur Ashram a couple of years back, where I was at the right place at the right time, at multiple times, this time around too I was at the cottage gate at the right time, said the right things, security obstacles melted, and I was, like magic, seated at His feet. What times those are! Just sit there, look at him, listen to what he says, observe elderly people asking child-like questions, often childishly. I wonder at such occasions if I have a question too, but it’s like a part of the brain has been wiped clean and I can’t remember any. Once the gathering seemed to be dispersing, I introduced myself to him, and he extended his hand for a handshake. We shook hands for a moment and that was it. So I had these two very nice meetings with Master. Almost no words were exchanged between us, but what the heart feels reveals more than any number of words can. For these experiences, I cannot thank my Master enough. Here is an old photograph of my Master, Shri Parthasarathi Rajagopalachari, from a book cover. This photograph is at least fifteen or twenty years old. His appearance has changed a lot now, but he still is as handsome as ever. Will upload a recent photograph later, as I need to find out certain things about copyright related instructions from the Mission. We were supposed to leave from Chennai on 16th December – flight to Delhi and then a train to Allahabad. Thanks to Spice Jet (not saying this sarcastically, really, thanks!) for delaying the Chennai-Delhi flight to such an extent that we’d have missed the connecting train. So sitting in our room at the Ashram, we changed all the reservations. We left from Chennai on 17th morning, reached Delhi at noon, and another flight from Delhi to Allahabad. No railway station, more flights – what more could I have asked for? Here is my only photograph of the trip. When you are the one in your group holding the camera, everybody gets clicked but you. Sadly, no photographs of me in the Ashram (I mean sadly for me). 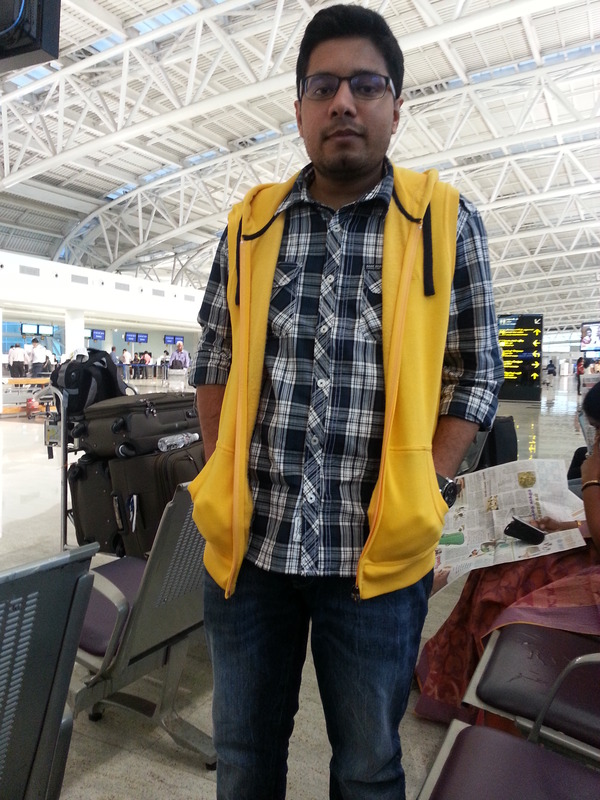 This one is in Chennai airport, when we were waiting for our flight to start boarding. I am trying my best to hide my excitement – I am at an airport, after all. Reached Allahabad at 3pm on 17th. Terrible feeling. Coming back from His abode to the world. There are always after-effects of a visit to the Master. It is said that when you feel like that, all his work is settling in – the work that He has done on you when you were there. I was completely lost for two days. Was meeting people, went out with friends one evening, but could not remember simple details later on – such as, which places we visited, did we make plans for later – all lost, as if these details were never registered. Now, a week has passed, and everything is back to normal. Will visit Chennai again, and again. Must be with Master at least thrice every year. If it was up to me, I’d visit Him every month. Or better still, just be with him for months on end. In such visits I realize the importance of achieving financial freedom as fast as possible. Career and money should not be in the way of me and my Master. They will not be, soon. This entry was posted in Uncategorized and tagged Airplane, Allahabad, Ashram, Chennai, Food, Guru, India, Journey, Master, Meditation, New Delhi, Sahaj Marg, Shri Ram Chandra Mission, Spirituality, Tamil Nadu, Travel on December 26, 2013 by suyashmisra. Christmas – when the town went crazy! I agree that I have weight issues, and I blame my nationality. How can we have so many festivals, with special sweets and cakes for each which we have to eat (How can we not? Tradition, see.) and still be fit? Today is Christmas. You would think that majority of the people won’t be as excited about it as they are on Holi or Diwali, well, think again. 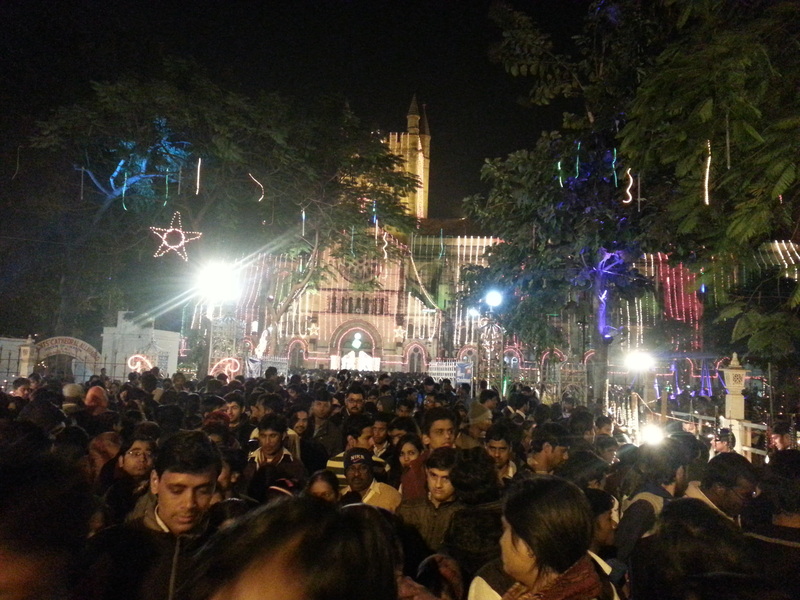 No day of the year will see as much crowd at Civil Lines (one of the better markets of Allahabad) than Christmas. New year’s eve, probably, may come close – we’ll see in less than a week. We have many churches here, but there is one that is commonly referred to as “The Church” – the All Saints’ Cathedral. It is most popular among general non-Christian population due to, well, it’s good looks. That’s where all the crowd was. And boy it was crowded! 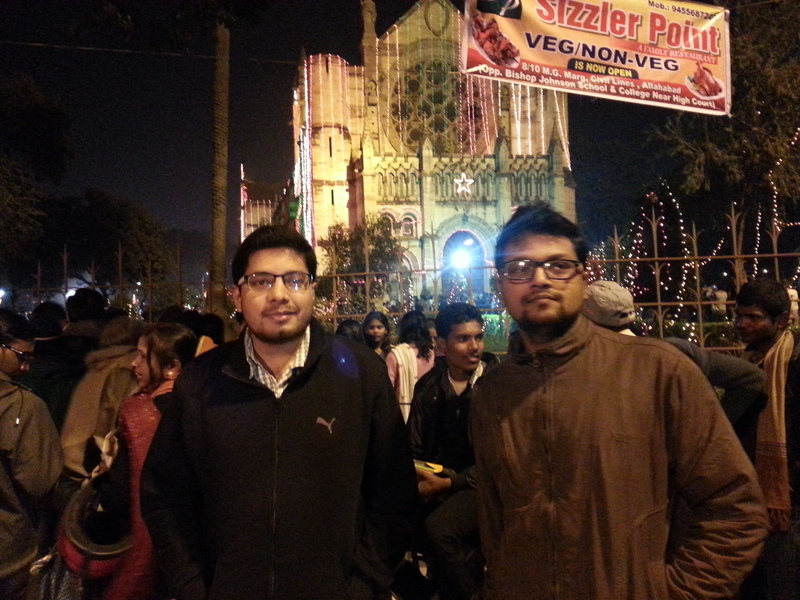 My friend, Nagendra, who is from Dehradun and witnessed Allahabad’s Christmas excitement for the first time, exclaimed in surprise, “I never knew Allahabad has such a large Christian population!” I and Shobhit, born and brought up here, told him that most of the people were not there for worship – they were there to have a good time, and the crowd comprised mostly of non-Christians. It was, in other words, a Mela – hindi word for a fair. 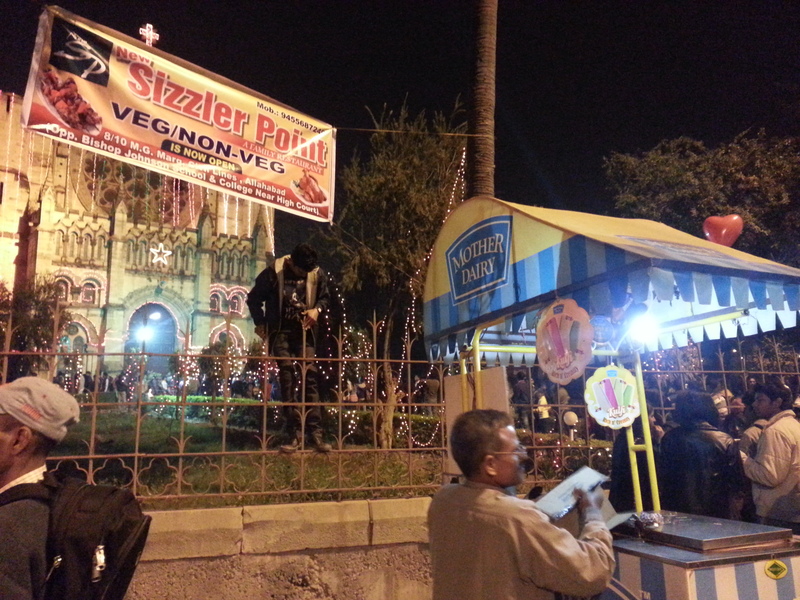 Small food vendors surrounding the church premises, products commonly seen in Dussehra celebrations on sale, even interesting (bordering on weird) services such as getting your name written on a grain of rice – it was all there! We circled around the church, braving the crowd which included people on foot as well as cars, two-wheelers, rickshaws, and more than a few animals scared out of their wits, to reach the entrance, but didn’t go in considering the multidirectional forces of varying degrees we’d have to overcome in the process. We tried taking some pictures of ours but the resultant images came out really funny. They somehow reminded us of Bulla Ki Jaana Music video! That’s Nagendra. At this point we realized there wasn’t much else to do, unless we wanted to buy LED torches or decorative lights for our bike tyres, which we absolutely didn’t, so we clicked some more photos, went to a nearby cafe for some coffee, and then came back home to the warmth only an angeethi can provide. I can’t stand it’s fumes, though, so I am back amidst the cold in my room. 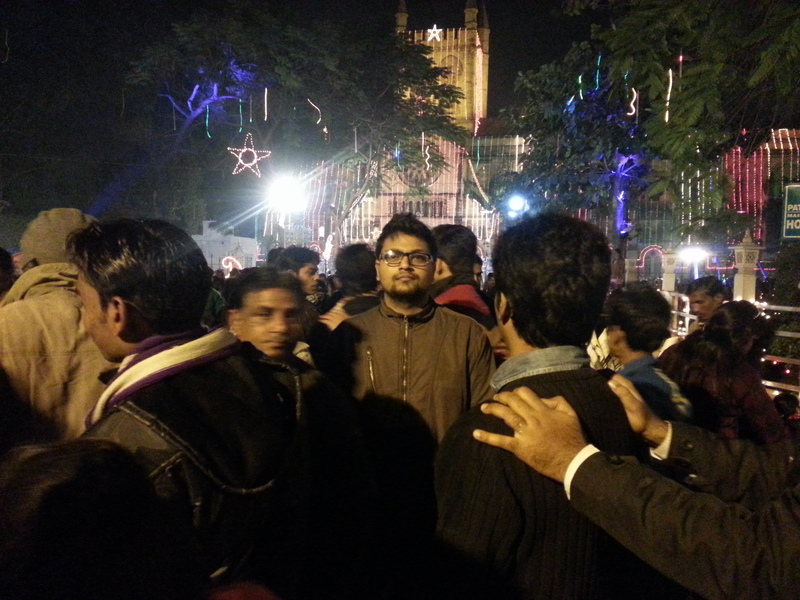 This entry was posted in Uncategorized and tagged Allahabad, Christmas, friends, fun on December 25, 2013 by suyashmisra.